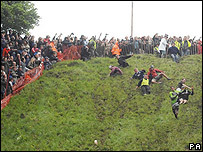 About 3,000 people converged on Coopers Hill in Gloucestershire for the annual spring bank holiday cheese-rolling event. Dozens of competitors chased the 7-8lb Double Gloucester down the steep slope, which is 200m long and has a 1:1 gradient in places. Jason Crowther, from west Wales, won the first race to complete a hat-trick of victories over the last three years. The 25-year-old said: "There's no training you can do for this." He added: "It was a bit slippery and I heard something crack, which I think was my knee. "But there aren't any tactics involved, as you can probably see." Aaron Walden, 20, from Gloucester, also won for the third time - beating a man dressed in a nappy to the bottom of the hill. About 25 volunteers from the St John Ambulance were on hand to treat the inevitable injuries, while a team from Search and Rescue Assistance in Disasters was also on hand to treat any medical emergencies. Psychologist Jemima Bullock, 33, from Wellington, New Zealand, was the winner of the ladies' race. "It's pretty well known back home and it's always on the news," she said. "It was a bit slippy out there but I think that actually helped. I guess you've got to be a bit mad to do this." Paul Jones, from the St John Ambulance, said 20 people had been treated for minor injuries. "It's the lowest figure for some time. Last year it was about 34. No-one was knocked out and most of the injuries we treated were for cuts and bruises and sprains." Competitors from all over the world take part in the competition. The competition, which is thought to date back hundreds of years, consists of a series of downhill races, with the winner of each receiving a cheese.